Thanks for stopping in, I hope you have some fun/creative time slated for the weekend. I'm back with more Stamp2Cut FUN! It's totally addicting! Once you get started you just don't want to stop. 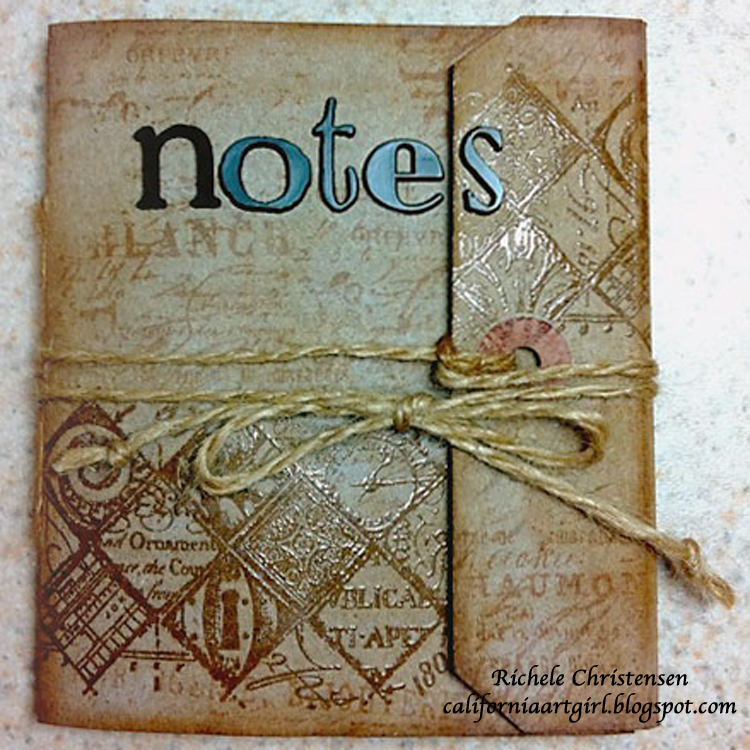 This is a note pad covered with Stamp2Cut goodness. The note pads are 4" x 6" available from the office supply store. I used Stamp2cut Cartridge #1 and the eClips. Look at the dimension of the Eiffel Tower and it was so easy. Stamp the image, cut the image out with Stamp2cut and pop dot to your project. It doesn't just cut a rectangle around the stamped image. It will cut the Eiffel Tower and the post mark. Stamp2cut will cut a shadow that's a perfect fit. If you don't want to use a stamped image with it you can make it larger or smaller as well. Your imagination has no limits! For the Note Pad here are the particulars. Stamp Pais stamp onto Manilla card stock twice with Jet Black Archival Ink. Cut images out with Stamp2cut. One full frame and the second just the piece of the Eiffel Tower. Cut the “Carte Postale” out with Stamp2cut on the Black Kraft’Core. Sand edges with a sanding grip. 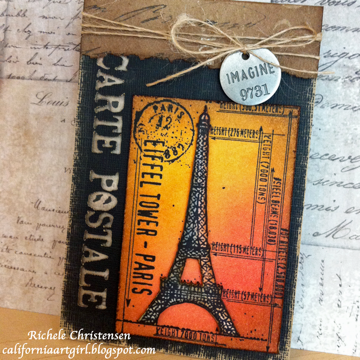 Ink the Paris piece with Distress Ink on an Ink Blending Tool. 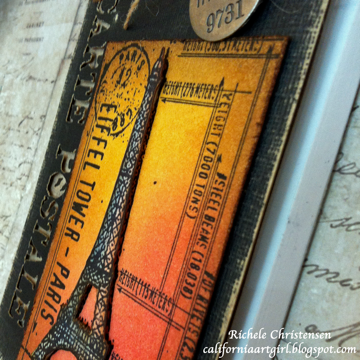 Paint the Eiffel Tower with Distress Ink applied to the Craft Sheet and pick the ink up with a Detail Water Brush. I used two colors to create the look as if light is coming from one side. Layer the Carte Postle piece over the card stock with pop dots. Line up the Eiffel Tower over itself with pop dots. Fold the Kraft Resist piece over the top of the Note Pad. Tear the edge and ink the edges with an Ink Blending Tool. Adhere the Note Pad Cover that was created above to the Kraft’Core and then glue to the back of the Note Pad. Tie twine around the top tying a Philosophy Tag in the bow. Check out Inspiration Emporium for the supplies you need for this project. Thanks for taking the time to see what's been happening in my studio! I'm so excited to show you my project today! Stamp2cut meet Pop 'n Cuts. It's SPOOKY fun! This is the outside of the card. I am still amazed by the detail that Stamp2cut can cut. AMAZING! That's all I can say. My dad was over today and I was showing him the detail from this card. He asked if I would cut that out by hand. I answered, I could but I wouldn't. Stamp2cut brings to the table an element of using cut images in a way you wouldn't normal because of how much time it would take. And to get a shadow perfectly cut to size. SPECTACULAR! And here's the inside. 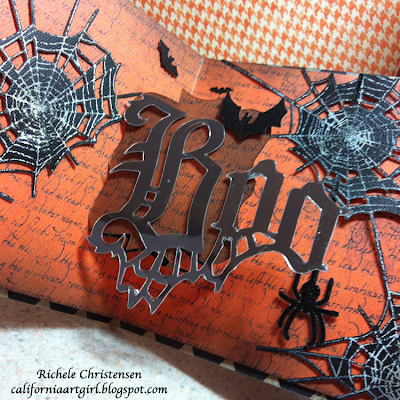 Look at those spiderwebs, cut using Stamp2cut, so much detail. WOW! The gothic BOO is on the Pop 'n Cuts portion of the card. Pop 'n Cuts is great for adding dimension to any card and Pop 'n Cuts makes it so easy. That Karen Burniston is BRILLIANT! Head over to the Sizzix blog for the step by step instruction. There's a whopping 19 step photos for you to be inspired by. The most I've ever done for one post. Whew! I have a few projects over on the Ranger Ink web site for you to check out. 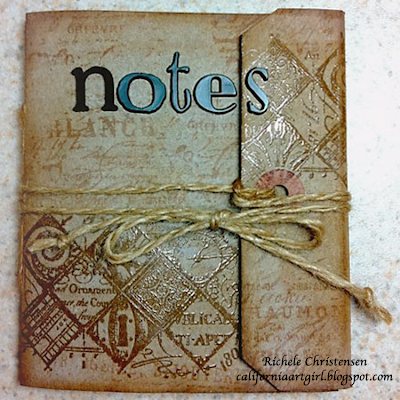 First is this little "Notes" book made from a #10 Kraft Tag. I love the larger tags. You can make cards, journals, bigger tags...The tags also come in a #12 size, kraft, black and of corse manilla. 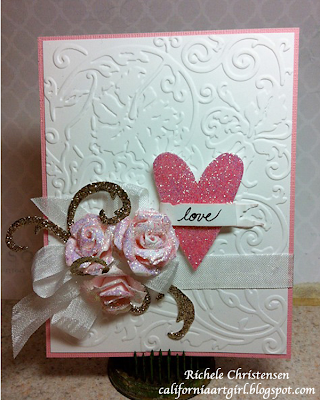 Next up is my "Love" card featuring the new Stickles Dry Fine Glitter. Look at the shimmer. 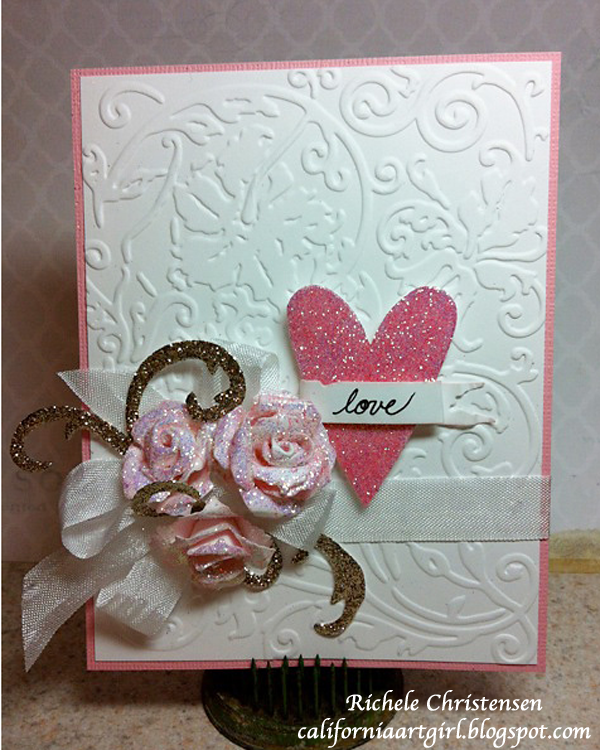 You can use the glitter with glue, wonder tape and even the new Sticky Embossing Powder. So many colors to choose from. 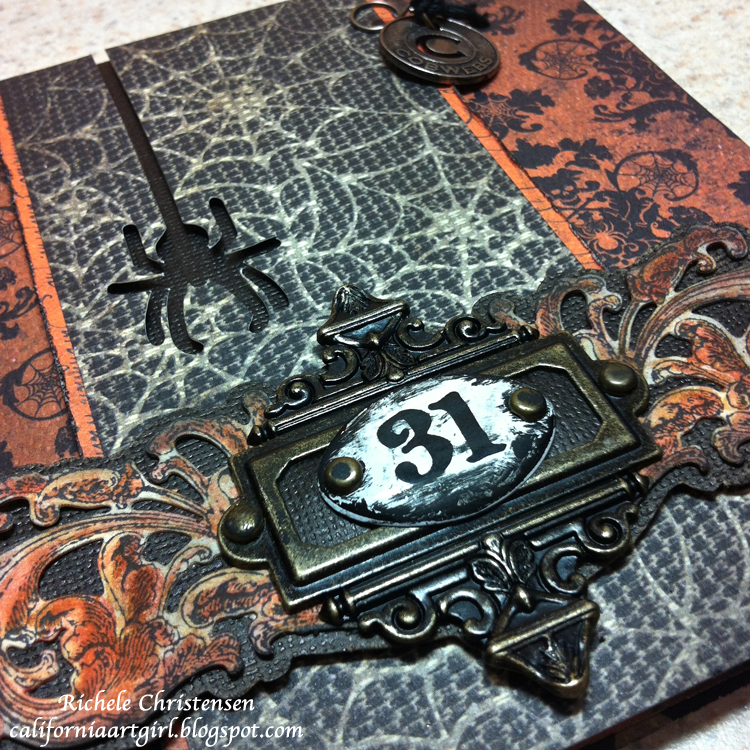 Check back tomorrow, I can't wait to show you my Sizzix project featuring Stamp2Cut and Pop 'n Cuts. It's spooky fun! !